He works in the marketing department of a News Media organization and claims he has had a near sedentary lifestyle with spurts of fitness on and off. He weighed 88 kgs and was on the verge of being classified as overweight and also bordering on being diabetic. 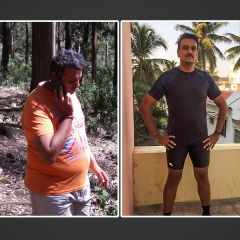 That’s when he realized he needed to be health conscious and not be on the sidelines of life….Here is Natarajan Viswanathan’s story in his own words. I never had a fitness regime in my life. I would once in a while feel that I think I need to lose weight and I would spring into action following an exercise regime. I would remain focused, taking my resolution to lose weight seriously but soon lose interest and again go back to being laid back. I took up a gym membership for 3 years but barely hit the gym religiously, hardly making any difference to my weight or the fitness factor. Friends and family made fun of me for not being able to hold on to any fitness regime. In December 2014, I went for a full body check-up. All the tests were normal but, I was told by the doctor that I was bordering on diabetes. I have a family history of diabetes. What the doctor said then scared me and that is when I got serious about reducing my weight and getting fit. One evening we had a college reunion and there I got introduced to GOQii by a friend of mine. He explained how it works and what it can do for me. This discussion got me interested. But, he did have a word of caution when he said that just wearing it will not reduce your weight but one needs to make efforts to get active and reduce weight. Things just don’t happen. 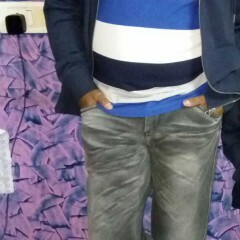 Had lost 14 kgs weight earlier but now weight had plateaued with no loss despite efforts. 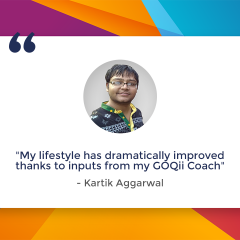 My journey with GOQii started in April 2015 and got Komilla Pareekh as my coach. They say that every journey needs motivation and direction. The band provided the much-needed motivation and the coach gave me the right direction. Many a time you want to do it but you either do not know how to go about it or you are plain lazy. I chose Komilla as my coach because she is a nutritionist and for my journey to a fitter life, I knew I should eat well and right. 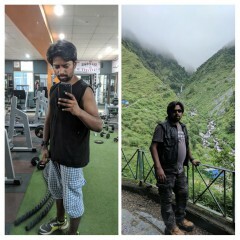 When I got on to GOQii my health goal was to become fitter and reduce my weight. I wanted to fit into a pair of jeans I had got out of for a long long time. I worked towards it along with my coach and am I glad to say that I have achieved my health goals. I have reduced considerably from 88 kgs I am down to 74 kgs. My pre-diabetic condition is under control and I run 10 km now four days a week and my bigger goal is to run the Marathon in 2017. Improved nutrition by focusing on high fibre, high protein and small frequent meals. Introduced millets in the diet. Cut down fruits at night, added a salad to meals. Worked on knees and back exercises. Morning walks After Surpassed 6km goal. Starting jogging now. Weight loss and inch loss. The good news is that I got into the pair of jeans that I wanted to get into for a long time. Personally, how do I feel now? I feel fantastic. I have become more presentable. I never had confidence or communication issues but, I will not deny that now after having made these changes to life, my first impression in business meetings is good. All these changes in me have also been noticed by my near and dear ones. I have been a great influencer to people around me and also got 4 others to register on GOQii. I will certainly continue with GOQii and be motivated to be healthy and active.Another super initiative is the Karma point initiative. You can earn points and donate them to a cause you believe in. It gets you connected to your social quotient. So I have donated 4000 points to the education cause and for the Chennai floods. Great initiative. Keep it going. What does Coach Komilla have to say about Natarajan? 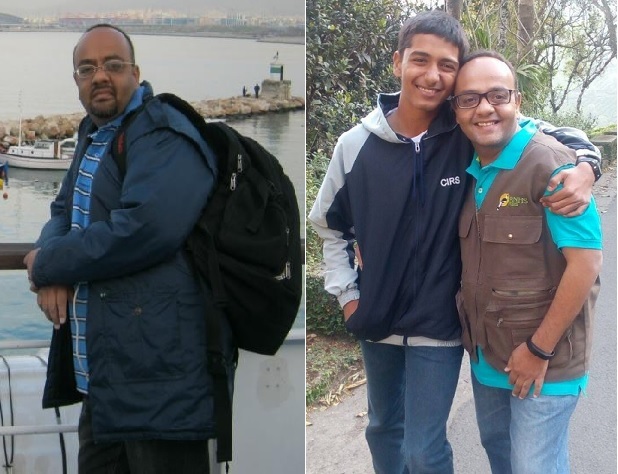 When Natarajan joined GOQii, he had plateaued on his weight, despite having lost 14 kgs in past due to his will and determination. Being a borderline diabetic, he was advised by his doctor to lose a couple of more kgs to avoid medication. Also, he was nurturing a dream of walking 6 km in a single stance and to participate in a Marathon. The journey was not easy, but surelya challenging one full of hurdles- knee pain, back pain, time constraint, sweet craving, Mumbai rains …..but, he never lost the focus. Today, he runs not walks 10 km in a single stance and has lost weight and inches to settle on his healthy weight. The biggest strength of our relationshipand working was mutual trust and belief. Natarajan truthfully discussed all the challenges faced by him in working towards our goals and kept firm belief in his coach. That is the secret of our success!